It’s official, San Antonio Spurs forward Tim Duncan has announced that he will retire after 19 seasons with the organization. Since drafting Duncan, the Spurs won five championships and posted a 1,072-438 regular season record, giving the team a .710 winning percentage, which is the best 19-year stretch in NBA history. Aside from going down as the greatest Power Forward in NBA history, there are of course, a number of incredible stories from his legendary career. Here, we’ve picked out 16 of the best of them, let us know in the comments if we are missing any! Jesse James Leija is a local San Antonio boxing legend, as a local featherweight and welterweight, he won two world championships. As a promoter, he helped put 39,247 fans in the Alamodome for the Saul “Canelo” Alvarez-Austin Trout fight in April. As a trainer, he helped Tim Duncan lose 25 pounds in the off-season, and improved the conditioning of Duncan’s teammates. Once, Duncan asked Leija to spar outside the Spurs practice facility in the summer heat. Former NBA player Etan Thomas, who played against Duncan during his time in the NBA, shared a great story on him playing against Duncan. “So we’re playing the Spurs and I get the ball on the post. I inside pivot and sweep to the middle for my jump hook and he blocks it,” Thomas wrote on his Facebook page. “So as we are running down the court he says to me – ‘that was a good move but you have to get more into my body so you can either draw the foul or I can’t block it’,” Thomas said. 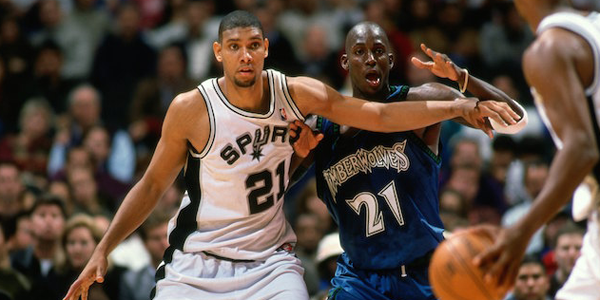 “Tim Duncan is honestly one of the nicest guys in the NBA and one of the best power forwards ever. Respect,” said Thomas. 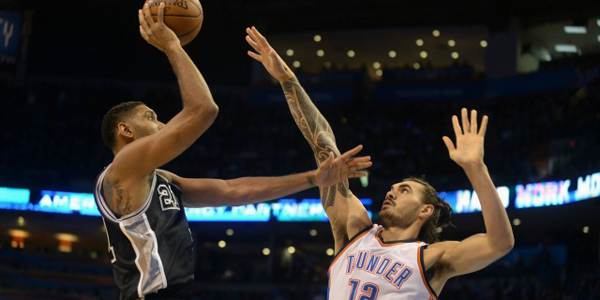 Steven Adams said that when he was a rookie, Duncan, who’s almost 20 years older, played mind games with him. He played “the nice guy card” to get the eager rookie off his back. Green is considered one of the best defensive players in the league – he is a finalist for the defensive player of the year award along with Kawhi Leonard – and his trash talk is among the greats currently in the league. No one ever seems to quit on Pop no matter how loudly he screams. No one checks out. Pop’s been a yeller since he took over for Bob Hill just 18 games into the 1996-97 season and hasn’t mellowed yet. To this day, though, Pop has the rare privilege of knowing his best player is still willing to step face-first into the coach’s full-throttle spittle if Pop thinks that’s what the team needs to see. “That’s who Tim Duncan is,” says Hawks coach Budenholzer, having received countless scoldings of his own, like every key Spurs staffer, over the course of his lengthy run as one of Pop’s top assistants. Tim Duncan developed very convincing counters to ward off old age and heavy mileage and what looked to be the beginning of the end in the 2010 playoffs, when the Spurs were swept by Phoenix after tormenting the Steve Nash-led Suns for years. New Golden State Warriors coach Kerr, who played alongside Duncan for four seasons and was the Suns’ GM at the time, marvels at where Duncan was in those playoffs compared with where he is now after changes to his diet and an even greater commitment in the workout room. “This guy works so hard in the summertime. You don’t even know. I go to the practice facility about five or six times during the summer to shoot baskets or work out or give someone a tour … and Timmy will be there every time. “The assistant coaches tell me stories about how they’ll bring in free agents to woo or some of the kids they’re thinking about drafting, they’ll go in and Timmy’s in the gym working out. And they’re like, ‘Tim Duncan is here?’ They’re shocked. If Duncan was struggling through the stretch run of the season with a sense that the finish line, like it or not, was fast approaching, Kevin Martin could never tell. “He does the exact same ‎thing at the exact same time every day,” Martin said. “I remember the game we played in Golden State [in early April]. We got beat pretty bad and Pop was going to rest everybody the next night in Denver, but Timmy wanted to play. The whole rest of the starting five and Manu rested, but Timmy wanted to play on some random [Friday] night. After Chris King’s rookie season with the Seattle SuperSonics, his agent, Bob Kingsley, arranged a tour for NBA players to raise money and awareness following a spate of violence in the Virgin Islands. They gathered a ragtag team using any connections they could, and the biggest attraction they landed was Alonzo Mourning, who by that time had become a star. When the NBA players arrived, word circulated about a 16-year-old, 6-foot-9 center with deft touch who used to be a star swimmer. King grew curious. 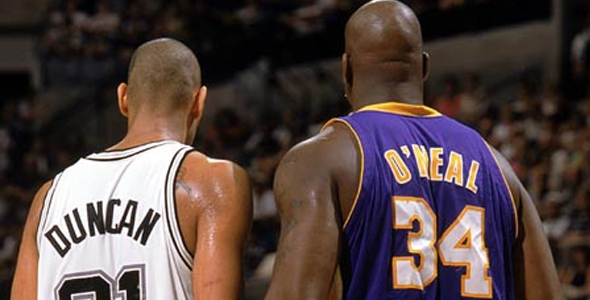 Inside a packed gym, Duncan matched up against Mourning. Early on in the game, Duncan caught a pass on the block, turned, squared up and banked a shot in over Mourning. 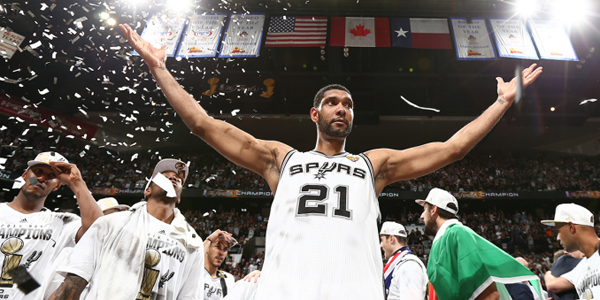 The rest of the night, King said, Duncan “dominated” Mourning. King figured Mourning was going through the motions in a charity game, but Duncan’s performance still blew him away. “You could see he was a little raw, but you could see he had the touch,” King said. “When I saw him doing that on the low block, it was like, ‘Wow.’ Jump hook. Fade. This one play, I’ll never forget. Alonzo tried to go up. Tim blocked the shot, and he ran the floor like a deer. Someone threw it to him, and he dunked all over Alonzo. Greg Oden was interviewed in Dime Magazine in 2007 and was warned about not taking Tim Duncan lightly. Shaq and Tim had a number of memorable match-ups over the years, but Shaq says, TD is the one guy he couldn’t get a rise out of. “Right away. We played against him when I was with the ’96 Olympic team against the college team. He played against Me, Shaq and Hakeem and he had an easy 22 and 10. I thought WOW, I never watched that kid but he’s pretty good. Then a few months later we were able to draft him and I knew we were in good shape when we drafted him. In the fall of 2003, during the Spurs’ preseason training camp, most of the players stayed at a local hotel at the team’s behest. Ferry and Steve Kerr, however, decided to commute from their homes. Both were nearing the end of their careers and had kids. They figured the hotel was intended for the younger players, to keep them in line. On the third day of camp, Ferry and Kerr pulled up to the practice facility just as the team bus arrived from the hotel. A succession of rookies exited the bus. At the rear was Duncan, six years in the league already. He took one look at Kerr and Ferry. “Wait a second, are you guys staying at home?” Duncan asked, incredulous. In arguably one of the greatest games of his career (which many say was actually a quadruple double), he kept it cool in the post-game interview. After hearing his stat line – in the sixth and final game of the 2003 Finals where he won a championship — 21 points, 20 rebounds, 10 assists and eight blocks, he responded.